Does the partnership pass the sniff test for suitability? For example, even if the company donated all of its profits, Hummer would never be a good partner for Greenpeace. Sounds obvious, right? But I’ve seen some partners that seemed poorly suited this year, including Trident promoting Save the Children nutrition and literacy programs. Gum doesn’t fit with nutrition—or literacy, since it’s not even allowed in libraries or schools. Operation Smile would have made more sense as a partner. You want a fit that makes sense to the consumer - it’s stickier that way (pun intended). You also want a fit that makes sense to the partners, who should look for a deeper win-win. An ideal partnership is one where the cause and company’s objectives reinforce each other. A close cousin of suitability, authenticity is about the company walking the talk of the cause. A nice example is the Pure Prevention campaign, which my organization helped plan and support (so I’m biased). Luna Bar walks the talk of health concerns and nutrition, so it makes sense for them to support a cause that focuses on the environmental causes of breast cancer. Check it out here. Lots of research, including from Cone, shows consumers will buy cause-related products over those that don’t have a charitable tie-in, PRICE AND QUALITY BEING EQUAL. So don’t think alignment with a cause is a unique value proposition, unless you have the same price and quality. If you don’t, you need other selling points. 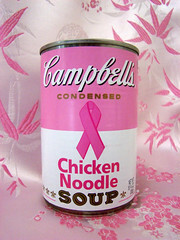 The Susan G. Komen partnerships make things pink, which believe it or not, is a selling point—people went crazy for Campbell’s cans in pink because they looked neat (and were different and unexpected). So color can actually be a selling point. What value can you add to you add to the product in question that extends and supplements the charitable merits it presents? Figure it out. You want people to buy into this! I can’t emphasize enough how important it is to follow these principles - and don’t just take my word for it. From Cause-Related Marketing Blog, here’s a great analysis of what happens when you don’t.